16 Virtues to ace any race – #15: Willingness to Dream | JustRunLah! The exhilaration comes when you approach the finishing line, with the huge SEIKO timer set up at its side. The seconds tick by – you distract yourself from the pain a little by recalling the time you had started and count the number of minutes and seconds you had taken to finish this course. Not bad, you think. The crowd flanking the sides are chorusing. Their reverberating energy recharges you. You push a little harder for just a bit more. As you come closer, photographers kneel down close by you. They direct the lens in your face. You don’t know whether to smile, or to look serious. You try to rearrange your face into some semblance of a winning runner. You think about the people who would be celebrating this success with you. Further ahead, some of your fellow runners have finished. They’re waiting around for friends to join them and might already be wearing their finisher’s tee. Thud, thud, thud. Your feet is heavy and you can feel the exhaustion sinking in. But you know it’s just another 30 seconds, 20 seconds, and 10 seconds before you yourself become one of the finishers. You stride another foot ahead of the other. The final distance closing in. As you push through the last time pad installed on the ground, you feel a rush of joy. Pride, then excitement. The last glorious lap is going to be one you relish for a while. At least for the few hours you spend massaging your sore feet and downing 100PLUS like you hadn’t had some on the course. None of these can describe the emotions you are feeling. Later, you’d be busy taking Instagram shots, and walking around the carnival in search of freebies. But for now, you collapse at the nearest empty spot, bathing in the pleasures of your own dream come true. 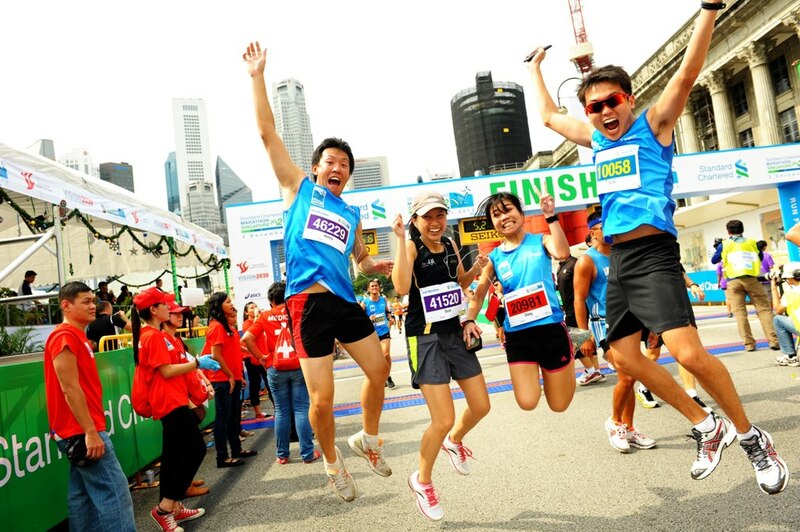 During the run itself, envision how you’d feel and what you’d see when you race across the finishing line. Would your parents be there? Would you be going for breakfast at your favorite Old Changi Airport Rd Hawker Centre after that? These create positive self talk that can give you strength during the race. Don’t be afraid to dream about success and about achievement.